Begin your day with a Golden Circle tour, operated by Reykjavík Excursions. The tour departs at 9:00, with pick-up beginning at 8:30 each day. On this tour you will visit the geothermal Geysir area, the famous Gullfoss waterfall and the UNESCO site Þingvellir National Park. You will also make a stop at Friðheimar greenhouse to learn more about how we grow vegetables in our harsh climate thanks to geothermal heat, bumblebees and an advanced irrigation and lighting system. Geysir is located in the south of Iceland, near an area called Laugarvatn. The most popular feature of Geysir is called Strokkur, which is a very active geysir that shoots water into the air for up to 30 meters (98 feet) every few minutes. Gullfoss is one of Iceland’s most popular and famous waterfalls. It lies in the glacial river Hvítá and drops into a 62-metre (105 feet) canyon, giving you amazing views and great photography opportunities. Your Golden Circle tour ends with a drop off to your hotel back in Reykjavík. You will then have 3-4 hours before your Northern Lights by Boat tour departs. 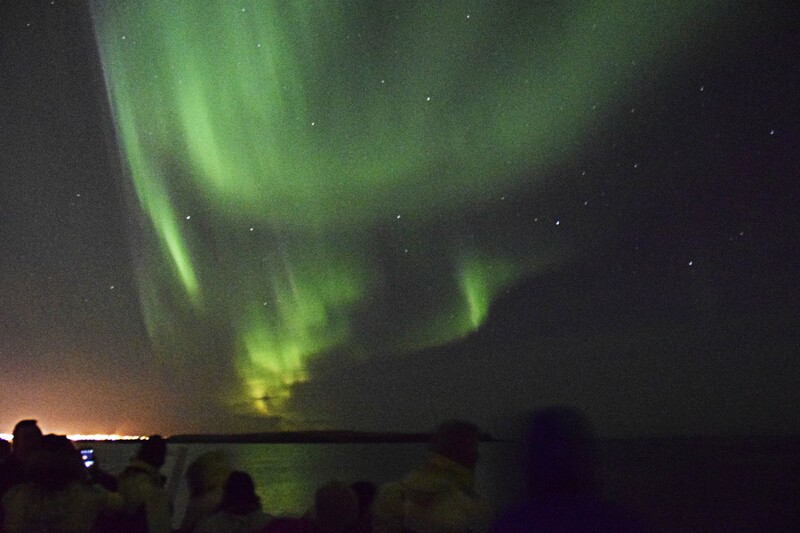 The Northern Lights tour departs at 21:00 from October 1st – March 14th, and at 22:00 from March 15th – April 15th & September 1st – September 30th. If you have selected hotel pick-up for this tour it will begin 60 minutes prior to departure. Our tour sets sail from the Old Harbour in Reykjavík’s city center, and in just 15-20 minutes you will be in a prime location away from the pollution from the city lights – perfect for viewing auroras! Your guide will share facts on the science science behind the magical phenomenon of the Northern Lights, and tell you stories & myths about the lights from different cultures around the world. The tour takes roughly 2-3 hours depending on how early/late the lights might appear. We recommend putting on our free overalls on-board (overalls also available in children’s sizes!) that will keep you nice and warm out on the deck, listening to what the guide has to say about the lovely colours dancing in the sky. Throughout the tour we show our very own original Northern Lights video, full of interesting facts and folklore! If you are cold you can grab a drink at the bar and cozy up inside watching the video or just simply enjoy the view of the city lights in the distance with your friends/family.